Space tethers. Unlike space rockets and space probes, it is not a topic many people are familiar with. You may wonder what tethers have to do with space, or what they would be doing there. You may also wonder why it would be interesting to read a book about them. On Earth, tethers, otherwise known as ropes or lines, are used primarily to bind things together and for climbing and pulling things up. Rock climbers and bungee jumpers use tethers, most elevators are based on them, and even people walking their dog can be considered users of terrestrial tether applications. In space, tethers have similar uses. For instance, they can be used to connect spacecraft to other satellites, space stations, or even asteroids. An advanced tether system, called a "space elevator," may even link Earth's surface directly to orbit, so you could climb all the way into space. Space tethers also could be used to swing spacecraft from one orbit to another, or even from planet to planet, without using rocket propellant. Tarzan, the fictional jungle king of Edgar Rice Burroughs made famous in numerous movies, used a similar form of tether transportation, swinging from tree to tree on jungle liana vines. Although he is not a rocket scientist, Tarzan has to keep in mind various things that are also critical for designers of space tether systems. For instance, good judgment of the strength of tethers is vital; a breaking vine would seriously ruin Tarzan's day. Moreover, our jungle hero needs to select vines of the right length to reach the place he wants to go. With a too short liana, he will not get to his destination at all; if the vine is too long, he will land too low and maybe even hit the ground. Then there is always the danger of crashing headlong into a tree, so good planning of direction and speed is vital. Tarzan swings and grabs one vine after another to get through the jungle. That means he needs to know when to let go in order to reach the next vine, and also make sure there is actually another good one to grab at the end of his trajectory—all in all, a fairly complex task, especially for someone educated by apes. Renting a jeep or a boat may be a better idea. In space, however, tethers have many potential advantages. You can use them to get to the Moon and Mars or de-orbit spacecraft back to Earth without any rocket propulsion. 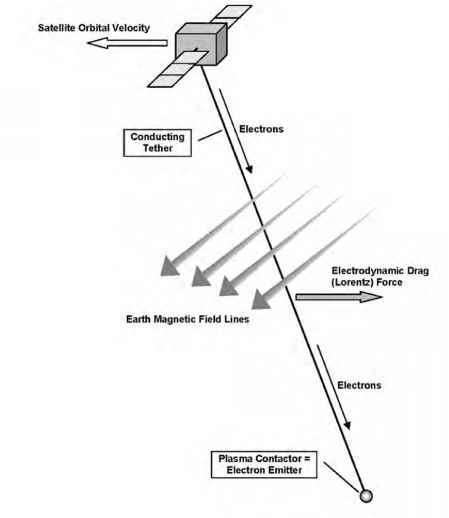 You can drag them through Earth's magnetic field to generate an electrodynamic braking force, and at the same time produce electrical energy for the spacecraft. You can connect several spacecraft with tethers to accurately position them for formation flying. You can create artificial gravity inside a spacecraft by swinging it around at the end of a long tether. And think how much easier it would be to be able to put satellites on a space elevator and simply release them from the top floor, rather than launching them with expensive, noisy, non-reusable, propellant-gulping rockets. Sounds like science fiction? As you read on, you may be amazed to learn about the number of actual space tether projects that have already flown. These range from small suborbital rocket experiments to large and complicated systems flown onboard the Space Shuttle. The first experiment flew as long ago as 1966, onboard the crewed Gemini 11 mission! Up until now, all tether space missions have been experimental, but in this book you will see what they may lead to. There is a wide array of ideas for small-scale as well as large-scale concepts that have the potential to revolutionize spaceflight in the coming decades. This book first discusses the basic concepts regarding the use of space tethers, and the physics underlying their functioning. Next, we discuss where the ideas for space tethers came from and what missions with relatively simple tethers have already flown. The chapters after that describe more futuristic possibilities, using tethers to transport spacecraft from Earth into space, operate them in Earth orbit, and even make interplanetary missions more economical. Last, we discuss the main challenges that face the most exiting and potentially most useful applications of large space tethers. Many thanks to Clive Horwood and John Mason of Praxis, who suggested that I write a book about this fascinating topic. John Mason's comments and inspiring suggestions were of great importance. Stella Tkatchova once again did an excellent job reading the text from a nonengineering perspective, and Alessandro Atzei helped tremendously by reading from an engineering point of view. My space-qualified friends Torsten Bieler, Peter Buist, Dennis Gerrits, Zeina Mounzer, Ron Noteborn, Rogier Schonenborg, and Arno Wielders provided ideas, useful comments and psychological support. Special thanks to the guys from Delta-Utec, Erik van der Heide and Michiel Kruijff, for up-to-date information on their YES missions and a critical look at what I wrote about tether deployment and dynamics. And last but certainly not least, thanks to my wife, Stefania, for all her support, comments, suggestions, and patience.